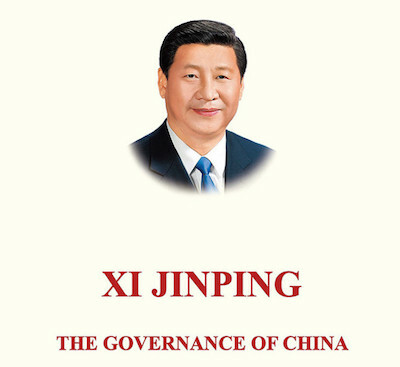 The Governance Of China (translated from the Chinese 谈治国理政) is an anthology of public statements by Chinese President Xi Jinping. The first entry is Xi's acceptance speech following his appointment as General Secretary of the Communist Party in November 2012. The book also includes photographs of Xi, one of which - showing the President holding an umbrella - has since been appropriated by pro-democracy protesters in Hong Kong. Most of the book's texts are speeches delivered by Xi, or diplomatic correspondence signed by him. The only exception, from Rossiya-1 television, is a softball interview with Xi: it was broadcast in Russia (China's main ally), and Xi's answers are extended monologues (with no interruptions from the interviewer). In what could almost be a parody of obsequious questioning, the presenter asks: "How do you feel as the leader of such a big country? What hobbies do you have? What are your favourite sports?" (page 113). Internationally, Xi's most famous remarks are from a January 2012 anti-corruption speech: "We should continue to catch "tigers" as well as "flies" when dealing with cases of leading officials in violation of Party discipline" (page 429). The most notorious 'tiger', Xi's potential rival Bo Xilai, is currently serving a life sentence. Ultimately, The Governance Of China is a propaganda exercise. It concludes with an overtly hagiographic Xi biography: "Xi is a man of compassion..." (page 482); "Xi regularly shows a strong sense of responsibility towards the future of the nation..." (page 483); "A dutiful son, Xi often strolls and chats with his mother..." (page 494).